A little late to the party but arriving dressed to the nines, this week we’ve got the keys to the most diminutive AMG currently offered, the CLA45. 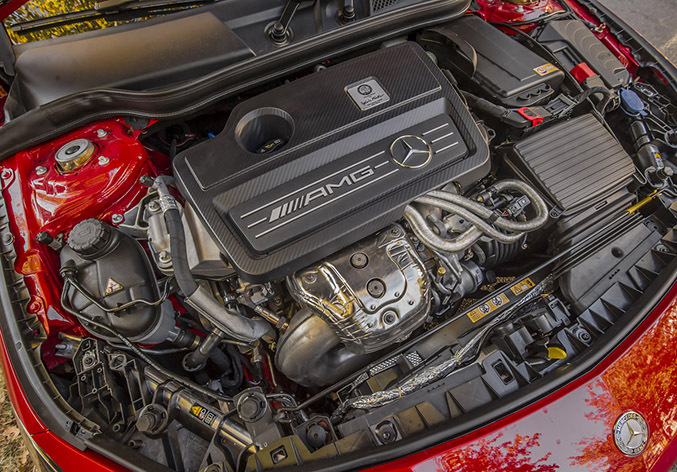 A substantial bump in power from the standard model is always par for the course with an AMG treatment, so the CLA45 gets its motivation from a a 2.0-liter turbocharged and direct injected four cylinder motor making 355 horsepower and 332 pound-feet of torque which is hooked to seven-speed dual clutch transmission that sends the grunt to all four wheels – a substantial change from the 208 hp / 258 lb-ft found in the front wheel drive CLA250. 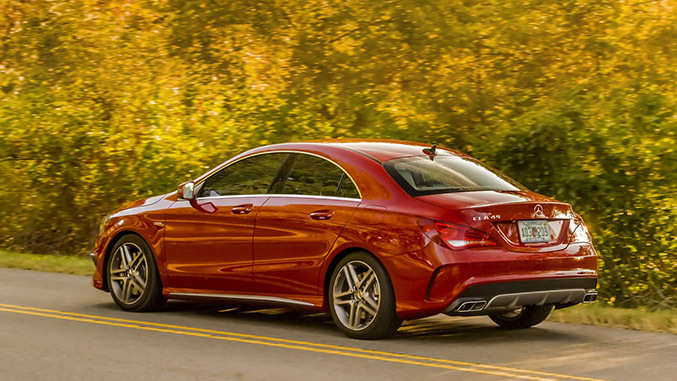 The CLA45 also gets uprated suspension, high performance rubber wrapped around 18-inch AMG wheels, and an AMG performance exhaust system to go along with the beefed up bodywork and the well-bolstered sport buckets that're designed to keep you held in place during high speed maneuvering. Like the CLA250, the CLA45 benefits from a striking interior design aesthetic that gives off an aeronautic vibe. Our tester sports the optional Multimedia Package, which includes the 7-inch high resolution LCD display, navigation, enhanced voice control abilities, 10GB of music storage, rearview camera, and other sundry bits – a worthy upgrade in our opinion. Despite coming equipped with the Premium Package, which includes the Logic7 Surround Sound audio package, performance of the stereo itself didn’t really set our hair on fire, but the Premium Package also includes luxuries like dual-zone climate control, heated front seats, and auto dimming mirrors, so for some it might be worth the expense regardless of aural prowess. Out on the road, the new seven speed DCT offers snappy, responsive shifts and the motor defies the expectations of its two liter displacement. We did note that when set to the Comfort driving mode, throttle response is positively lethargic – the car seemed to take tip-in as a suggestion rather than a command. Switching over to Sport mode corrects this behavior pretty effectively, and it’s the mode we switched to right away nearly every time we set off. The beefed up suspension components give the CLA45 a taut, confident ride, making our blasts through Angeles Crest highway a rewarding endeavor, but we couldn’t help but wish for a set of adaptive dampers here, as the ride did get a bit jostling around town at times.